* Web links that point to http://maps.google.com are redirected to the Maps app. * Web links that point to http://www.youtube.com are redirected to the YouTube app. * iTunes store links (http://phobos.apple.com/etc..) are sent to the iTunes (or App store) app. iPhone apps can also specify their own custom URL scheme (for example, myapp://doStuff). When might you want to use a custom URL scheme for your app? Defining your app's custom URL scheme is all done in the Info.plist file. Click on the last line in the file and then click the "+" sign off to the right to add a new line. Select URL Types for the new item. Once that's added, click the grey arrow next to "URL Types" to show "Item 0". Set your URL identifier to a unique string - something like com.yourcompany.yourappname. 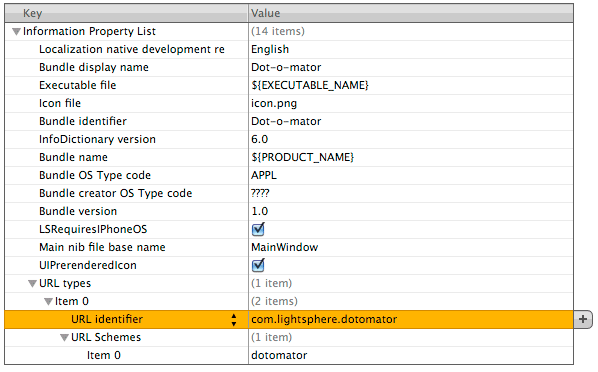 After you've set the URL identifier, select that line and click the "+" sign again, and add a new item for URL Schemes. Then click the grey arrow next to "URL Schemes" to reveal "Item 0". Set the value for Item 0 to be your URL scheme name.